Ever want to download RSS from news sites or blogs to your phone, PDA, ebook reader, or other handheld device to read offline? Feedme is a program for fetching stories from RSS or Atom feeds, from news sites, blogs or any other site that offers a feed. It saves simplified HTML files, or can translate to other formats such as Epub, FB2, Plucker or plain text for devices that can't handle HTML. Download: FeedMe is now maintained on GitHub: FeedMe. It's currently at 1.0b5. You will need Python 3, python's feedparser module (on Ubuntu or Debian, that's the package python3-feedparser) and lxml (package python3-lxml). Of course you can also install feedparser and lxml from PyPI if you prefer. So I wrote FeedMe. I've been using it daily for many years, so I guess it works well enough for my purposes. Maybe it will work for you too. 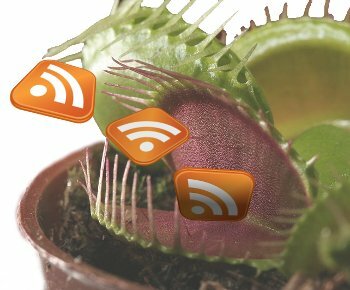 FeedMe is sort of an RSS version of Sitescooper. By default, it produces HTML that's been simplified to work well on a small screen, but optionally it can convert pages to plaintext, EPUB, FB2 or Plucker format. The sample feedme.conf configuration file should be vaguely self-explanatory, though it doesn't contain every option. Install your feedme.conf ~/.config/feedme/feedme.conf (the usual Linux location), or ~/$XDG_CONFIG_HOME/feedme/feedme.conf. The feedme.conf file should start with a set of default options in a section labeled [DEFAULT]. Convert all pages to plain ASCII. Useful for reading devices like Palm that can't display other character sets reliably. Where to save the collected pages. See save_days for how long they will be kept. Comma-separated list of output formats. Default "none", which will result in HTML output. Other options: epub, fb2, plucker. Print lots of debugging chatter while feeding. The minimum number of characters in an item link. Links shorter than this will be padded to this length (to make tapping easier). Default 25. How long to retain feeds locally. The recommended way of adding a new feed is by creating (or linking) a new file in your feedme config directory, the same location where feedme.conf lives. If you wish, you can also define feeds by adding sections directly to the feedme.conf file. (though page_start and page_end will probably be more complicated than that on most sites). The -n (nocache) option tells feedme to fetch stories even if there's nothing new; while testing, you want that since otherwise, after the first time, feedme will tell you that there are no new stories to fetch. Once you have a basic site, you can start tuning the site-specific options. The RSS URL for the site. Level 1: only save the RSS page. Level 2: save sub-pages. Don't save images. Default true. Clean up the HTML: try to remove things like text colors and sizes that sometimes make stories unreadable. Normally, if one page times out, feedme will assume the site is down. On sites that link to content from many different URLs, set this to true. Normally feedme will try to guess the encoding from the page. But some pages lie, so use this to override that. Don't check whether we've seen an entry before: collect everything. Normally feedme will ignore images from other domains (usually ads). But some sites link to images from all over; set this to true in that case. If we're not allowing nonlocal images, setting block_nonlocal to true will rewrite the img src attribute of all nonlocal images. This will cause some "broken images" tags to show. Use it if you're on a fixed data plan and don't want to incur extra data charges downloading images while reading stories. Default false. These options aren't as easy to explain or understand, but you may need them for particular sites. On sites that use srcset for their images, how big do we want them to think our screen is? Integer, default 800. Limit RSS entries to this many characters. This is for sites that put the entire story into the RSS page. Normally, feedme will only fetch images from the same domain as the site being read, and if nonlocal_images is set, it will replace all other images with a dummy image. alt_domains specifies a list of domains that are acceptable sources of images for a given site, for sites that host images somewhere other than their normal domain. Sites that spread stories over many pages often have a naming convention in their "view as single page" URLs. This is a pattern, e.g. http://exmaple.com/.*single.html. Feedme will look for this pattern in a story, and if it sees it, it will follow the link and use it instead of the original story link. For sites that embed annoying things in the middle of stories: maybe video clips, or ads, or distracting pull-quotes. Anything matching one of the skip_pats will be deleted from the story. Skip links with these patterns. Skip anything with titles containing these patterns. Skip anything whose content includes these patterns. When to check this site, if not always. May be a weekday, e.g. Sat, or a month date, e.g. 1 to check only on the first day of any month. Feedme always produces HTML as an output format. If that's all you need, the default formats = none is fine. Downloaded HTML will be put in ~/feeds/ (which must exist; you can specify a different location as dir in feedme.conf). Feedme can then convert the HTML into one of three formats: epub, plucker, or fb2. To get them, set formats = epub (or plucker, or fb2). You can specify multiple formats, comma separated, e.g. epub,fb2. You'll need to have appropriate conversion tools installed on your system: plucker for plucker format, calibre's ebook-convert for the other two. FeedMe can optionally convert each page to plain ascii, eliminating accented characters and such (displaying them used to be a problem on Palm PDAs, but shouldn't be needed for most modern devices). For this option, set ascii="yes" in feedme.conf and install my ununicode module somewhere in your python path. Warning: these conversions haven't been tested in a while, though they used to work fine. If you have problems, please file a bug or contact me. Feedme's configuration file is ~/.config/feedme/feedme.conf. Feedme's cache is ~/.cache/feedme/feedme.dat. This file should remain relatively small if you have a sane number of feeds, but it doesn't hurt to keep an eye on it. Feedme will also keep backup cache files for about a week, named by date; you can use these to go back to an earlier state in case you lost your feeds or accidentally deleted something. ~/feeds is where it stores the downloaded HTML by default (you can change this as dir in the feedme.conf). Stories are downloaded as sitename/number.html, e.g. ~/feeds/BBC_World_News/2.html. These stories are cleaned out every save_days (set in your feedme.conf). If you save to formats beyond plain HTML, there may be other directories used for the converted files; for example, plucker files are created in ~/.plucker/feeds. This is never cleaned out by feedme, so you'll have to prune it yourself. When I used plucker as my feed reader, I had an alias that ran rm ~/.plucker/feedme/* to remove the previous day's plucks just before I ran feedme. FeedMe's license is GPLv2 or (at your option) any later GPL version. Thanks to Carla Schroder for the name suggestion! Currently, I read the feeds I fetch with Feedme with an Android program I wrote, FeedViewer. I'm the first to confess that it's not very well documented, though, and in particular there's no documentation on how to set things up so that FeedMe can generate files that FeedFetcher can generate automatically. If you're trying to use this and can't figure it out, let me know, otherwise I may never get around to documenting it.